* You can give it as a gift to your friend, if he’s a fan of the motorcycle, or a collector. * Metal Crafts Metal crafts decorations that people like something, it can make someone, somewhere (home, office …) becomes more noble. Beautiful, tasteful. Decorations can play a decorative role and set off. * This is a Fantastic and Unique of Handmade Metal Art Motorcycle Model. * It made from recycle metal (Iron wire, screws, nuts, bearings) with complicated detail by artisan of Thailand. * The Wheels can roll and also the handlebar can turn. * Each item has been carefully designed, cut and welding. * This is also a great gift for your child or someone who loves motorcycle. – Inquiry:Any inquires will be answered within 24 hours. Efficiency is highly appreciated everywhere. – After-sale service: If for any reason you are unhappy with our products,Please don’t hesitate to contact us. – We’ll take full ownership and responsibility for the quality of our products and will do the best to solve your problem quickly and efficiently. 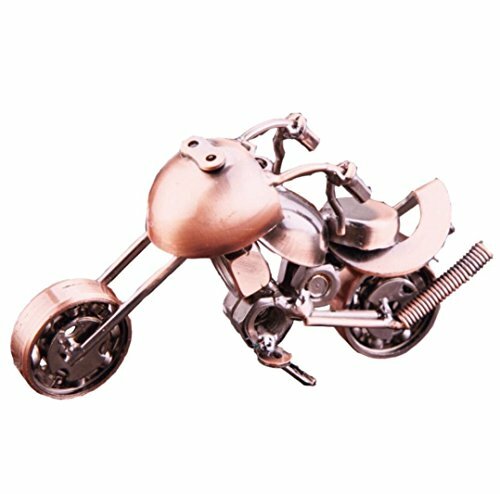 100% Hand Soldering Unique Handmade Metal Art Motorcycle Mode for Moto Lovers. Made from recycle metal through complicated workship. Environmental plating process, Antioxidant,great for gifts,collection and home decor. Wheels moveable, makes it a great toy for childrens over 7 years who loves vehicles. Vivid style, full of personality, excellent workmanship. Handmade, toys and gifts ornaments decorations.